The itinerary in the right sidebar under “2010” is not theoretical, and is all one trip. This journey will take place after the All Star break, and will take me to Anaheim, San Diego, San Francisco, Oakland (I know it’s a dump, but we’re there and the Red Sox are in town), Phoenix and then finishing up at Dodger Stadium. The tickets above, which just arrived today, are the second set received, but the last set purchased; with the exception of the San Diego game (where the Padres are playing the Diamondbacks), we’ve actually purchased all of our game tickets already. Some were purchased in regular preseason onsales, others were acquired on the secondary market. We’ve been pretty picky about where we wanted to sit and while we’ve got an eye for bargains, it’s a once-in-a-lifetime trip so we’re willing to splurge a little. I have to keep reminding my friends out West that I don’t sit in seats this good at home, and even then, I’m still getting more for my money – even in Los Angeles! – than I do out in Queens. Without giving everything away (while there is a strategy, there’s also a healthy mix of patience and a ton of grunt work involved) it’s really a matter of figuring out what the season ticket holder discount is, and then – as with any ticket for any event – deciding what it’s worth to you personally. There is an element of wondering if the price will go down, if someone will suddenly put up a pair of magic tickets because life gets in the way and they just want to get back what they paid for it (or at least not totally eat the tickets). It’s exciting to watch the tickets start to roll in. It makes the whole trip seem a lot more real. PEOPLE WHO DO GOOD STUFF. GOOD EXAMPLES IN BASEBALL ADVERTISING. Wow, you really did get great seats for Dodger Stadium. I don’t think I’ve ever been that close to the field while simultaneously pretty much right behind home plate. Section 3 is awesome. BTW I read that the Dodgers are reinstating the free shuttle to the stadium that runs from Union Station – check it out – I know we will do that for at least a few games, because we can take the subway to Union Station from pretty close to our house (yes we have a subway in L.A.). 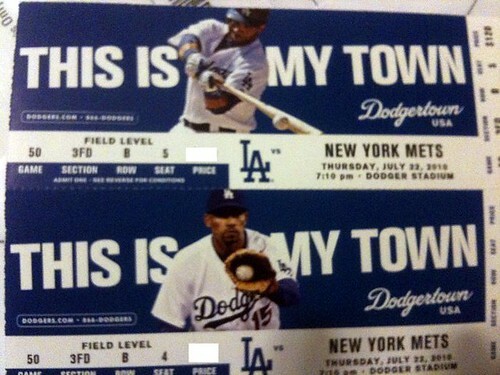 We are going to Boston for the Dodgers-Red Sox series in June, and it’s been a nightmare to procure those tickets. Didn’t get chosen in all three lotteries we entered. Joined Red Sox Nation because they had a day pack that included guaranteed tickets to the first game. Ended up with pavilion club tickets for the second and third games by calling Fenway directly – way too much $$$ but at least paid only face value and no garbage add-on charges and we have those in hand. We’re behind the dugout on the first base side for the Saturday game, and still undecided about Friday – that may be the game to try throwbacks on.